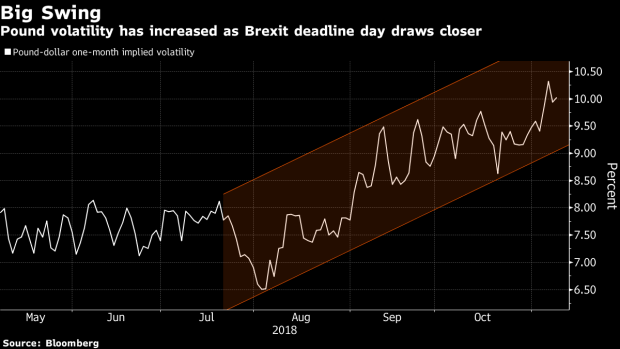 (Bloomberg) -- Even fund managers who were once shunning the pound are now betting on a rally as the U.K. heads toward a Brexit divorce deal. Allianz Global Investors, which has been consistently short the pound since the referendum in 2016, has switched to multiple long positions on the currency. Union Bancaire Privee sees volatility rising and is looking to buy sterling on conviction it is undervalued. Sterling had been on a downtrend this year as the deadline to pull out of the European Union drew closer. The mood has changed this month, spurring a 3 percent rally in the pound to above $1.31, with optimism building that a divorce deal can be struck as early as next week. Prime Minister Theresa May is said to have begun briefing her team on an almost-finished deal text. Brzezniak is targeting $1.35 in the short term and $1.40 within a year against the greenback, matching a level seen in a Bloomberg survey of analysts. He has long positions against the euro and Australian dollar as well, while UBP’s currency head Olivier Doleires is also buying against the Swiss franc. Previously, with the risk wide open for either a jump to $1.50 or a slide to $1.20 on no deal, investors were favoring bets on a move in either direction or on volatility, seen as relatively cheap even as uncertainty increased. A straddle trade, which profits on a sharp shift, has done very well, said Brzezniak. Money managers who put a three-month straddle on the pound-dollar pair toward the end of March would have made around 500 dollar pips on expiry, translating to a profit of $1.2 million on an initial outlay of $1 million, according to Bloomberg calculations. Yet that trade’s moment has passed for Brzezniak, with downside protection more expensive while a rally looks more likely. UBP, which manages 125 billion Swiss francs ($125 billion), is also more positive. Doleires is looking to increase his long position, especially versus the dollar and the franc, on the judgment the pound is undervalued. Sterling is still down 12 percent since the referendum, and he thinks it could “easily” reach $1.45 on a deal. --With assistance from Tanvir Sandhu.